Hi, friends! Sorry that I have been away from the blog. These past few weeks have been crazy, busy, and GREAT! I changed jobs, visited California, and just adopted another golden retriever. It has been an exciting spring! I kind of went crazy getting fruits and veggies! With the "reboot," you spend the first five days eating and juicing fruits and vegetables, the next five days juicing fruits and vegetables, and the final five days eating and juicing fruits and vegetables. The first two days were the hardest because of caffeine withdrawal related headaches. ;) Since then, I have felt fantastic. Those spring allergies are now gone. Over the next week or so, I'll be sharing some of the good eats and drinks from my reboot. This soup is as green as it gets! It is full of so many vegetables and good stuff like iron, calcium, folic acid, beta-carotene, and vitamin K. (Take that, gummy bear vitamin.) It tastes fresh, and the combination of veggies creates a great flavor. 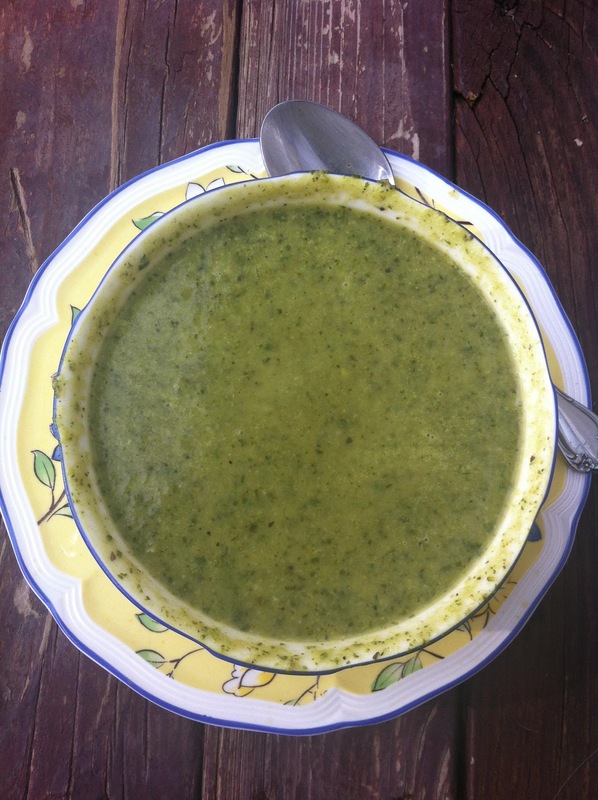 Veg it up with this green detox soup. In a large stock pot or French oven, heat the extra virgin olive oil over medium heat. Add the sliced leek and minced garlic, and sauté for about three minutes until you begin to smell a light garlic-onion aroma. Then, add the vegetable stock and the vegetables (broccoli, kale, zucchini, celery, and asparagus). Slowly bring to a boil, and stir occasionally. Cook until the zucchini is salt. Add salt and pepper to taste. To process the soup, use an immersion blender. Alternatively, you can transfer it to a blender or a food processor. Garnish with parsley and sliced green onions, and enjoy! And your new doggy is gorgeous!